The Symmetric Traveling Salesman Problem (STSP) is to find a minimum weight Hamiltonian cycle in a weighted complete graph on n nodes. One direction which seems promising for finding improved solutions for the STSP is the study of a linear relaxation of this problem called the Subtour Elimination Problem (SEP). 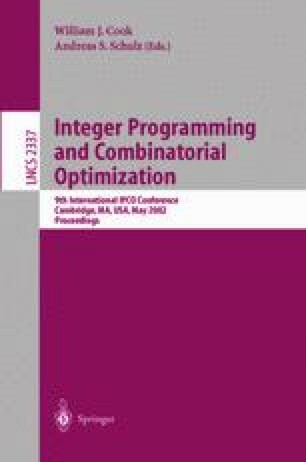 A well known conjecture in combinatorial optimization says that the integrality gap of the SEP is 4/3 in the metric case. Currently the best upper bound known for this integrality gap is 3/2. Finding the exact value for the integrality gap for the SEP is difficult even for small values of n due to the exponential size of the data involved. In this paper we describe how we were able to overcome such difficulties and obtain the exact integrality gap for all values of n up to 10. Our results give a verification of the 4/3 conjecture for small values of n, and also give rise to a new stronger form of the conjecture which is dependent on n.
This research was partially supported by grants from the Natural Sciences and Engineering Research Council of Canada.